Prayer is at the heart of our church community; whether silent or spoken, on our own or with others, in church or elsewhere. We believe and have experienced that this is how we receive grace, strength and the healing love of God as well as support and care from each other. Intercession List. This is written on the pew sheet every Sunday and will be included in the prayers during the service. Names can be added to the list via Revd Simon Chambers 01747 852193 or Andie Blows 01747 853088. The names you give us can be kept on the list as long as there is the need and it is helpful to keep Simon or Andie up to date. Prayer Cards. There are cards in the church in the prayer corner for you to request a prayer. You can write a name and if you choose, a reason for the prayer. These will be included during the prayers only in the 7pm communion service on Thursday evenings and need to be renewed weekly. The Prayer Circle has a list of those who have asked for private prayer support. 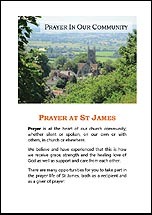 Contact Andie Blows 01747 853088 if you would like to use this form of prayer or for more information. It helps those who are praying to have a name and to know something about the person for whom they are praying but this can be discussed with Andie. Members of the prayer circle are asked to keep the names and any details confidential. Abbey School Prayer Partners. St James has strong links with The Abbey Primary School and each class has a supportive friend from the congregation of St James and St John who joins the monthly school service in church and can join the class in Collective Worship at school. For more details contact Jan Wilson 01747 855585. Reflective Prayer Evenings. These are held on the first Tuesday evening of the month and the venue and content will vary according to who is leading it on any particular evening. These evenings are often times of silent reflection together in between some readings and often, recorded music. They run from 7pm to 8pm. For details contact Jenny Webb 850931. All Welcome.